What constitutes a small space? We’d say a 419-square-foot studio apartment fits the bill. Expert Design Associate Mark Riddle from Room & Board Washington, D.C. walks you through a modern small space apartment and shows you how to carve out spaces for living, dining, sleeping and entertaining all within this tiny footprint. Mark worked with the team at 100K in D.C. to make the most of their studio units. 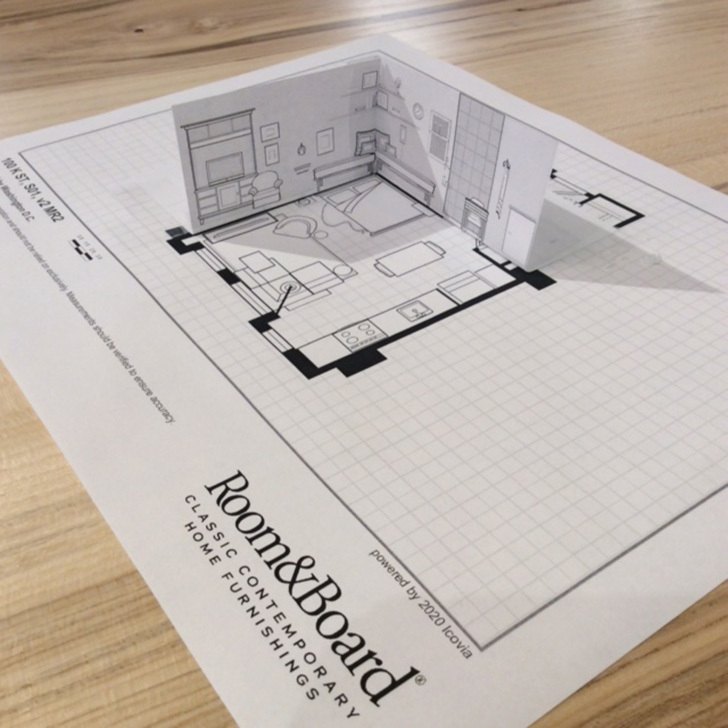 Floor planning and furniture selection is always available to you for free! Learn more about free design services and easily request an in-store or online appointment. 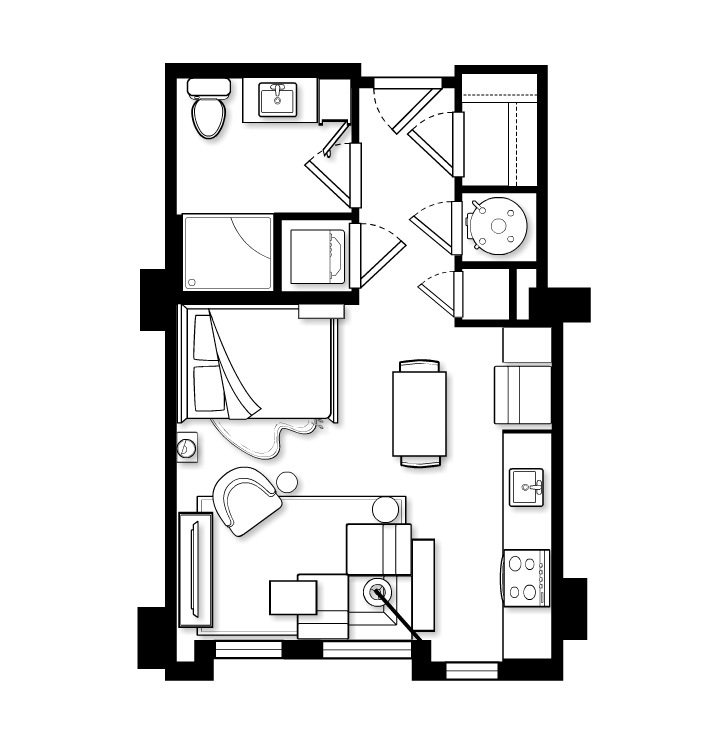 A look at the floor plan of this 419-square-foot studio apartment. Mark created a maquette – a scale model – of the plan. Sectionals can take up less space than a sofa + chair combination. An L-shaped sectional helps define this small living room and takes up less floor space than a standard seating setup. Position lighting on the wall, instead of taking up valuable floor space. Modern lighting solutions like sconces provide generous, overhead light output. Choose a mix of open and closed storage. Not all storage is created equal! Doors and drawers serve different purposes to better accommodate certain items. And you’ll love the option of open and closed storage to display some items while keeping others concealed. Maximize your walls with styled shelves and ledges. Uniform shelving can overpower a small space. Try staggered shelves to lighten the look. The varying depths of the Foshay wall shelf and Float Box wall shelves not only store extra items but add visual interest. Create a “daybed” look to define your sleeping area. This type of styling has all the comforts of a traditional bed but won’t look unnatural in an open studio space. Mark selected items that served multiple functions, included light and airy designs, and a mix of textures and materials that played off each other. Where dis you purchase the sectional?